BANGI, 7 August, 2010 – A total of 7,376 graduates receive their degrees at Universiti Kebangsaan Malaysia’s (UKM) convocation spread over four days beginning today, bringing the total to more than 138,000 graduates produced by the university in its 40 years history. Of the total for this 38th edition of the convocation, 233 obtained their Ph.Ds, 183 medical doctors and dental surgeons, 1,389 masters, 5,097 bachelors, 402 graduate diplomas and 72 diplomas. UKM Vice Chancellor, Prof Tan Sri Sharifah Hapsah Syed Hasan Shahabudin said she was proud that the university had for six consecutive years produced the highest number of Ph.D graduates from among the local universities. 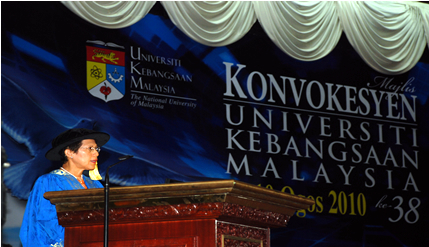 The convocation was officiated by UKM Chancellor, the Yang di-Pertuan Besar Negeri Sembilan Darul Khusus, Tuanku Muhriz Ibni Almarhum Tuanku Munawir. Also present were his consort, the Tunku Ampuan Besar Negeri Sembilan, Tuanku Aishah Rohani Binti Al-Marhum Tengku Besar Mahmud, the Pro-Chancellor, Tun Dato’ Seri (Dr) Ahmad Sarji Abdul Hamid, Chairman of UKM Board of Directors Tan Sri Dr Mazlan Ahmad, board directors, the Vice Chancellors and Rectors of a number of Institutions of Higher Learning and senior officials of the university. In her speech at the first session of the convocation Prof Tan Sri Sharifah Hapsah said UKM had to date produced 1,619 Ph.D graduates, 15,010 Master graduates, 2,438 doctors and and 119,072 Bachelor graduates. The total of 138,139 graduates is a potent network of alumni that could be strengthened within and outside the country. “We are proud that within that span of time, UKM has proven that it has the ability to lead in the field of knowledge, using the Malay language as the medium of instruction amplifying that it is a language of higher learning,” she said. In addition, UKM had also built up a solid system of quality of assurance. This system won the Prime Minister’s Quality Award in 2006. This quality assusrance system clinched a five-star rating under the Rating System for Malaysian Higher Education Institutions (SETARA). This status empowers the Senate of the university to approve programme of studies, the evaluation system, the conferring of degrees and the intake of students based on the high standard set by the university’s senate. In SETARA’s evaluation that was focussed on the quality of undergraduate studies, UKM was graded with a score of 5 or excellent. The quality of the programmes had in fact attracted the top students, including 2,583 from 56 countries. To strengthen its international standing, UKM had set up its first foreign office at Universitaet Duisburg-Essen in Germany. This office would enhance the twin-degree and staff exchange programmes of UKM’s engineering faculty with that German university as well as other European universities. Apart from the seven graduates who would be getting their twin-degrees in this convocation, a total of 62 graduates had been conferred this twin-degrees (double degrees) by UKM. To project the international appeal of UKM, the university has recently introduced a global exchange or mobility programme that attracted 78 students from 11 countries to come to UKM to study the uniqueness of the indigenous culture and heritage along with UKM students. In term of research, UKM had been re-evaluated after three years after being conferred a research university status. The university has maintained that status, and would continue to strive to be amongst the world’s best. Prof Tan Sri Sharifah said as a research university, UKM has an important role to play in the National Innovation Agenda that emphisized on creativity, innovation and entrepreneurship as a platform for human capital development and intellectual property to create wealth , especially through commercialisation. To speed up this agenda, UKM has set up an Innovation Collaboration Centre to move forward the innovation system through cooperation with different institutions inside and outside the country. Prof Tan Sri Sharifah Hapsah said UKM is also proud of the recognition given to its academicians. When the National Professors Council was set up on 1 April 2010 to harness the thoughts of the country’s intellectuals, former UKM Deputy Vice Chancellor, Prof Emeritus Datuk Dr Zakri Abdul Hamid, was appointed its chairman, while the deputy chairman was Prof Datuk Shamsul Amri Baharuddin, while the cluster head was Prof Datuk Dr Halimah Badioze Zaman, Prof Dato’ Dr Ibrahim Komoo dan Prof Datuk Dr Noor Azlan Mohd Ghazali all from UKM.